Holding a special dinner party or simply going to a friend's house for a meal? 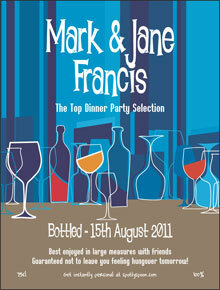 Don't just bring a bottle or serve up plain wine bottles, make a personalised wine for the occasion. 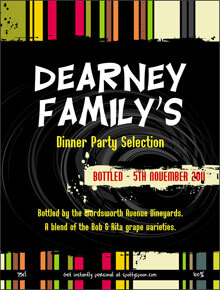 You can have the grape variety and country of origin if you want, but you can also make it unique with the host's name and address and the food it will accompany actually on the wine...brilliant! 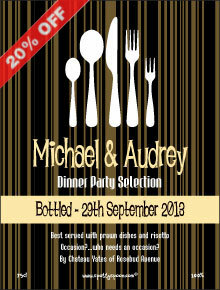 Therefore, you can have 'Perfect with Lasagne & Salad' or 'Complements Roast Beef, Potatoes & Peas, 'Ideal with Indian dishes', 'Serve with Seafood Chowder' etc.